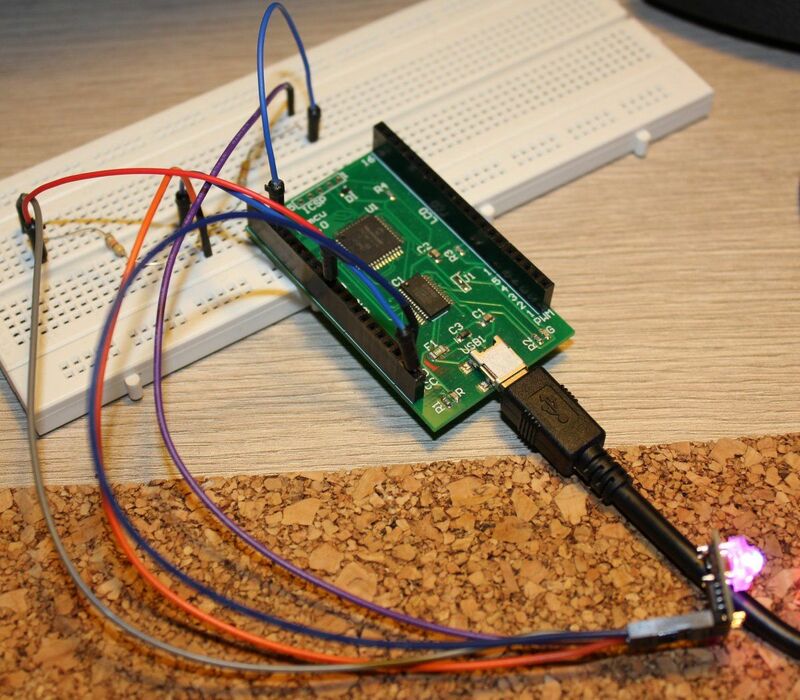 BlinkM is a tricolor LED board that uses I2C bus to communicate with a microcontroller. Also minipH and many other boards use this computer bus to communicate. Multiple microcontroller boards or single board computers support I2C - like Arduino, pyMCU, Raspberry Pi and others. In this article I'll showcase how to use those two board with pyMCU, and some general I2C tips and tricks. This board has a very bright LED which consists from three internal LEDs - red, green and blue. Using a composition of those colors it is possible to get any other, including white. Through I2C communication we can control colors or color change sequences. It's a very simple and cheap board, and it's quite easy to start with I2C or to test it on a less popular microcontroller board. It can be bought in multiple shops too. Documentation is a must to read. You will find Arduino example there (as well as a list of all commands). To do I2C communication you need two pins (clock and data). In case of pyMCU data is on D4 and clock is on D11 pin. BlinkM also needs power so you need to connect VCC/GND too. BlinkM has some Arduino examples in the documentation. pyMCU uses bit older, different schema of the API for I2C communication, which makes it harder to port Arduino code snippets. PyMCU uses two address format while Arduino just one doing all the bit shifting in the background. In case of problems, ask on the forums. 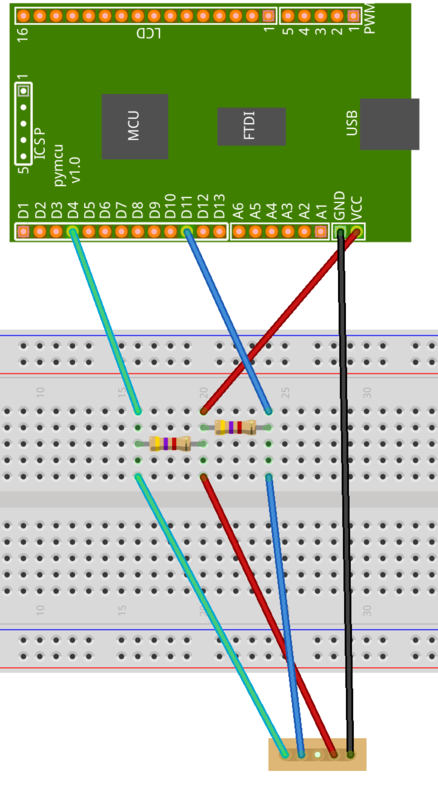 I2C communications starts with stopping the default color chance sequence. Then we do our own sequence by sending instructions in a loop. Due to the API differences the device address is 0x12 instead of 0x09. MinipH is a quite interesting board, which allows measuring pH of liquids using a BNC electrode. More scientific sensors are quite rare, and can't be bought in most of microcontroller-related stores. SparkFun offers some Atlas Scientific sets, but they cost much more as they are laboratory equipment of quite high quality. MinipH is cheaper and can work with cheap aquarium or more expensive and precise laboratory-quality BNC electrodes. You can find those electrodes on eBay (and also in some aquarium shops). Precision of measurement depends on the exact voltage the board gets as well on the electrode quality. To get good measurements you will have to calibrate your setup first. Breadboards allow for quick prototyping of electronic circuits, yet they don't offer reliable connections, especially those that will last in less friendly that desk conditions. We can solder the circuit on an universal PCB but that requires time and makes any fixes quite hard to implement. Fortunately there is a in-between solution called wire wrapping. In this article I'll showcase a simple tool for wire wrapping - an very old technique of wrapping wires on electronic components. More reliable than DuPont connectors and a breadboard yet quick and easy to wrap or unwrap. Pyboard can handle analog sensors and precise PWM control, but to get that we have to use one of the latest firmwares. 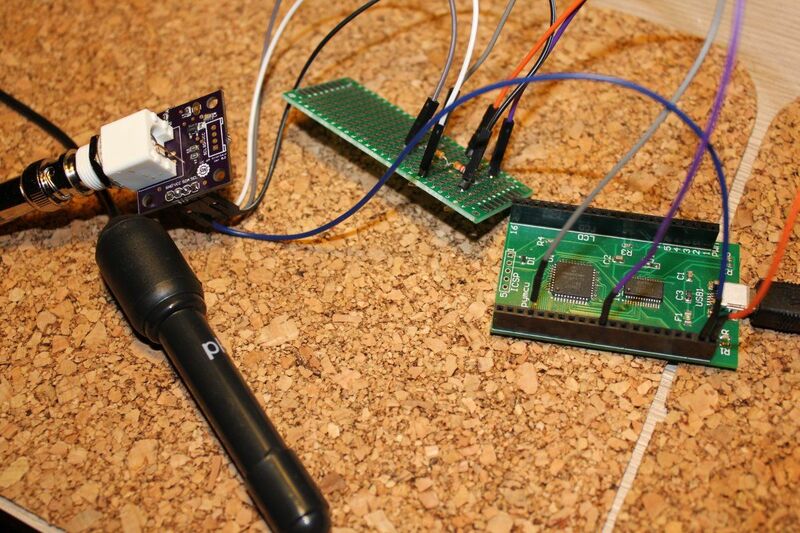 So let us update the firmware and test it with an analog joystick and PWM controlled DC motor board. So we continue our adventure with PyBoard and MicroPython. In this article I'll show how to use various electronic and electric parts with PyBoard - like DC and stepper motors, I2C devices, relays and sensors. MicroPython is a Python 3 implementation capable of working on microcontrollers with no operating system. PyBoard is the first microcontroller board running Micro Python. It can be scripted with Python code and can execute it, work without any connection to a PC. How does it work and what can we do with pyboard and Micro Python?